Dr. Walker’s interests in research and scholarship include nursing education, critical pedagogy, cultural safety and the practice of nurses with Indigenous peoples. 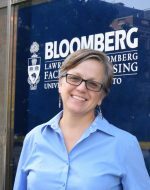 She brings an anti-racist and postcolonial approach to her teaching to draw students’ attention to the impact of racism and colonial policies and practices on the health of Indigenous peoples in Canada. Dr Walker’s teaching is informed by her experience in working with Indigenous communities and her commitment to tackling the racism that Indigenous peoples experience in the Canadian health care system. In her doctoral research, she examined the experiences of early career nurses translating knowledge of cultural safety into nursing practice. Her findings demonstrate that combining critical pedagogical strategies with cultural safety in nursing education helps early career nurses to build relationships with Indigenous patients, and in so doing, resist and disrupt discriminatory colonial practices in health care. Pamela Walker’s PubMed link is available here.